"Currently, there are three main approaches for pairs trading: distance, cointegration and copula. The traditional distance method has been widely researched and tested throughout the pairs trading literature. However, this approach only captures dependencies well in the case of elliptically distributed random variables. This assumption is generally not met in practice, motivating the utilization of copula-based models to address the univariate and multivariate stylized facts for multivariate financial return stocks. Nevertheless, the use of copulas in this context is still recent and needs more comprehensive and profound studies. In this paper, we will conduct an empirical investigation to offer some evidence of the behavior of the distance and mixed copula strategies. We propose, differently from Rad, Low, and Faff (2016) and Xie, Liew, Wu, and Zou (2016), a mixed copula-based strategy to capture linear and nonlinear associations and at the same time cover a wider range of possible dependence structures. We aim to assess whether building a more sophisticated model can take advantage of any market frictions or anomalies uncovering relationships and patterns. We find that the mixture copula strategy is able to generate a higher mean excess return than the distance method when the number of trading signals is equiparable. We also want to investigate the sensitivity of the copula method to different opening thresholds and how trading costs affect the profitability of these strategies. Our strategy consists in fitting, initially, the daily returns of the formation period using an ARMA(p,q)- GARCH(1,1) to model the marginals. For each pair, we test the following elliptical and Archimedean copula functions: Gaussian, t, Clayton, Frank, Gumbel, one Archimedean mixture copula consisting of the optimal linear combination of Clayton, Frank and Gumbel copulas and one mixture copula consisting of the optimal linear combination of Clayton, t and Gumbel copulas. We compare the performance out-of-sample of the strategies using a variety of criteria, all of which are computed using a rolling period procedure similar to that used by Gatev, Goetzmann, and Rouwenhorst (2006) with the exception that the time horizon of formation and trading periods are rolled forward by six months. The main criteria we focus on are: (1) mean and cumulative excess return, (2) risk-adjusted metrics as Sharpe and Sortino ratios, (3) percentage of negative trades, (4) t-values for various risk factors, and (5) maximum drawdown between two consecutive days and between two days within a maximum period of six months. Figure 3 shows cumulative excess returns through the full dataset for both strategies for Top 5 (top), Top 20 (center) and Top 35 (bottom) pairs. The left panels display cumulative returns on committed capital, whereas the right panels on fully invested capital. The main findings when the number of trading signals is equiparable are summarized below. 1. The mixed copula strategy is able to generate a higher mean excess return and a Sharpe ratio over twice as much as what we get from investing in the traditional distance method after trading costs. 2. The mixed copula approach delivers economically larger alphas than the distance method for both weighting schemes (10 and 58 bps per month on committed and fully invested capital, respectively) after transaction costs, suggesting the importance of the proposed method. It should also be noted that the alphas provided by mixed copula and distance strategies are significant at 1% and 10%, respectively, after accounting for several asset pricing factors such as momentum, liquidity, profitability and investment. Thus, the results show that the profits are not fully explained by the other factors. 3. As it can be observed, the right-hand-side tail (of positive outcomes) of the density of the five-year Sharpe ratio is longer for the mixed copula strategy, implying that the copula-based strategy has a better risk adjusted performance than the distance approach. 4. The share of days with negative excess returns is smaller for the mixed copula approach (41.79%) than for the distance strategy (46.98%) and the market performance (47.45%). 5. Neither strategy consistently shows superiority over all subperiods, at least on committed capital. Overall, the mixed copula strategy shows a superior out-of-sample performance relative to the distance approach in the second and third subperiods (1996-2000 and 2001-2005) and after the subprime mortgage crisis (2011-2015), while the distance method delivers a significant better performance in the first (1991-1995) and fourth subperiods (2006-2010) on committed capital." This paper examines price overreactions in the case of the following cryptocurrencies: BitCoin, LiteCoin, Ripple and Dash. A number of parametric (t-test, ANOVA, regression analysis with dummy variables) and non-parametric (Mann–Whitney U test) tests confirm the presence of price patterns after overreactions: the next-day price changes in both directions are bigger than after “normal” days. A trading robot approach is then used to establish whether these statistical anomalies can be exploited to generate profits. The results suggest that a strategy based on counter-movements after overreactions is not profitable, whilst one based on inertia appears to be profitable but produces outcomes not statistically different from the random ones. Therefore the overreactions detected in the cryptocurrency market do not give rise to exploitable profit opportunities (possibly because of transaction costs) and cannot be seen as evidence against the Efficient Market Hypothesis (EMH). "Despite a significant number of studies on market overreactions none of them has focused on the cryptocurrency market, which is the most volatile among financial markets: the average daily price amplitude in this market is more than 10 times higher than in FOREX, 7 times higher than in stock market and more than 5 times higher than in the commodity markets. This feature (combined with the fact that it is a very young market) makes it particularly interesting to examine for possible overreactions. This paper provides new evidence on the overreaction anomaly in the cryptocurrency market by testing the following two hypotheses: after one-day abnormal price movements (overreactions), on the next day abnormal price (i) counter-movements or (ii) momentum movements are observed. For this purpose, a number of statistical tests (both parametric and non-parametric) are carried out. A trading robot approach is then used to investigate whether any detected anomalies generate exploitable profit opportunities. The analysis is carried out for four different cryptocurrencies (BitCoin, LiteCoin, Ripple and Dash). Empirical Results: analysis confirms the presence of a statistical anomaly in price dynamics in the cryptocurrency market after overreaction days price changes in both directions (in the direction of overreaction and counter movement) are bigger than after normal days. (decrease) has occurred. The open position is closed at the end of the day when it was opened. Strategy 2 is based on the momentum effect, the so-called “inertia anomaly”: there are abnormal price movements in the direction of the overreaction on the following day. The trading algorithm is specified as follows: after the overreaction day the cryptocurrency is sold (bought) on the open price of the day after the overreaction if an abnormal price decrease (increase) has occurred. Again, an open position is closed at the end of the day when it was opened. BitCoin prices are used for the analysis (data availability motivated this choice) for the years 2015, 2016, 2017 in turn and then for the whole period 2015-2017. 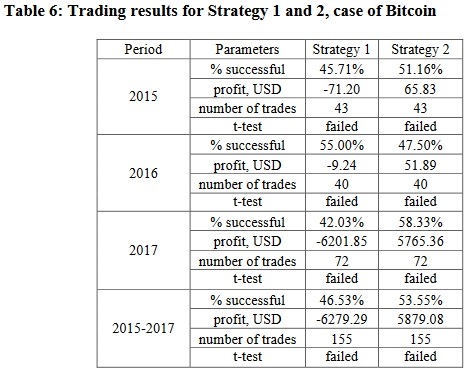 As can be seen, the results of Strategy 1 are rather stable and in general imply a lack of exploitable profit opportunities from trading based on counter-movements after overreactions in the cryptocurrency market. This applies to all periods. The t-test statistics indicate that the results are not significantly different from the random ones (see Appendix F for details); indirect evidence for this is also provided by the number of profitable trades, which is close to 50%. By contrast, Strategy 2 generates profits in each individual year as well as the full sample, but the results are not significantly different from the random ones (as implied by the t-test statistics). The number of profitable trades is close to 50%. Overall, trading based on the “inertia” anomaly cannot be considered profitable." Traditional capital structure theory in frictionless and efficient markets predicts that reducing banks’ leverage reduces the risk and cost of equity but does not change the overall weighted average cost of capital (and thus the rates for borrowers). We test these two predictions. We confirm that the equity of better-capitalized banks has lower beta and idiosyncratic risk. However, over the last 40 years, lower risk banks have higher stock returns on a risk-adjusted or even a raw basis, consistent with a stock market anomaly previously documented in other samples. The size of the low risk anomaly within banks suggests that the cost of capital effects of capital requirements is large enough to be relevant to policy discussions. A calibration assuming competitive lending markets suggests that a binding ten percentage-point increase in Tier 1 capital to risk-weighted assets more than doubles banks’ average risk premium over Treasury yields, from 40 to between 100 and 130 basis points per year, and presumably raises rates for borrowers to a similar extent. "The instability of banks in the financial crisis has reignited debates about capital requirements. One of the ongoing concerns has been that capital requirements might affect banks’ overall cost of capital, and therefore lending rates and economic activity. Many bankers appear to prefer lower capital requirements. They argue that because equity is more expensive than debt, more of it clearly raises the overall cost of capital. Economists, on the other hand, often view this argument as a fallacy. The textbook Modigliani-Miller logic is articulated by, for example, Admati, DeMarzo, Hellwig, and Pfleiderer (2011): “[B]ecause the increase in capital provides downside protection that reduces shareholders’ risk, shareholders will require a lower expected return to invest in a better capitalized bank”. Real capital markets contain frictions and inefficiencies that challenge the Modigliani-Miller assumptions, however, so the relevance of the frictionless-irrelevance argument is not so clear. Many of these frictions have been studied, but there has been surprisingly little direct evidence on the basic proposition that reduced leverage reduces the cost of equity. In this paper, we study empirically how leverage has related to the risk and cost of bank equity and, in turn, to the overall cost of capital. We are especially motivated by the possible interaction of capital requirements and the “low risk anomaly” within the stock market. That is, while stocks have on average earned higher returns than less risky asset classes like corporate bonds, which in turn have earned more than Treasury bonds, recent research emphasizes that the basic risk-return relationship within the stock market has historically been flat, if not inverted. We use a large sample of historical U.S. data and proceed to test the two steps in the traditional argument. First, we relate bank equity betas estimated from CRSP to leverage ratios from quarterly reports. Second, we relate realized returns on equity to bank equity betas. We also replace beta with idiosyncratic risk. The two steps together then allow us to calibrate the effect of increased capital requirements on the cost of equity and, under certain assumptions, the overall cost of capital. We reach similar conclusions when we relate capital to returns directly over the sample with good data on risk-adjusted capital ratios. We confirm that bank equity risk is sharply increasing in leverage. This is not surprising, and our work here extends that of Kashyap, Stein, and Hanson (2010). When capital is measured by the Tier 1 capital to risk-weighted assets ratio, the portfolio beta of the least-capitalized banks is 0.93 while the portfolio beta of the most-capitalized banks is 0.50. Higher capital ratios also predict lower idiosyncratic risk. Even this relatively large difference in beta is attenuated by two factors. Banks with riskier assets may choose to have larger capital cushions. This endogenous selection reduces the slope between beta and observed capital ratios. Does a reduction in beta translate to a reduction in the cost of equity? The answer from 40 years of U.S. stock returns is no. The low risk anomaly is actually a bit stronger within banks than other firms. High-beta banks returned less than low-beta banks, even on a raw basis, and even in a period of mostly rising equity markets. Value-weighted returns are, on average, 16 basis points per month higher for a portfolio of the lowest three beta deciles than for a portfolio of the highest three beta deciles. The spread between low and high idiosyncratic risk portfolios is 6 basis points per month. These effects are not mediated by capitalization. Controlling for a size factor increases the risk-adjusted differences, especially for idiosyncratic risk portfolios. More simply, beta is positively correlated with capitalization while idiosyncratic risk is negatively correlated, yet both risk types are negatively related to average returns. 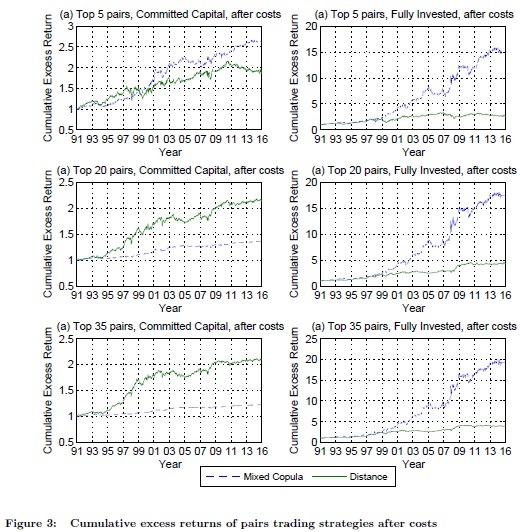 Putting the pieces together, the data suggest that more conservative capital structures reduce the risk of equity but may increase its cost, and the overall cost of capital, by bringing the low risk anomaly into play. To assess magnitudes, we focus on the beta anomaly and estimate how the overall cost of capital for a bank would have changed over this period given the hypothetical ten percentage-point increase in Tier 1 capital to risk-weighted assets experiment in Kashyap et al. (2010). A benchmark estimate of the pretax weighted average cost of capital for a typical bank implied by the Capital Asset Pricing Model over our sample period is 40 basis points per year above the risk-free rate. By reducing equity betas, banks with a full ten percentage point increase in Tier 1 capital would have added between 60 and 90 basis points to this spread, which would more than double the weighted average cost of capital over the risk-free rate to between 100 and 130 basis points. In a competitive lending market this would have translated to a similar increase in rates faced by borrowers." Title: Can Momentum Investing Be Saved? On paper, momentum is one of the most compelling factors: simulated portfolios based on momentum add remarkable value, in most time periods and in most asset classes, all over the world. So, our title may seem unduly provocative. However, live results for mutual funds that take on a momentum factor loading are surprisingly weak. No US-benchmarked mutual fund with “momentum” in its name has cumulatively outperformed its benchmark since inception, net of fees and expenses. Worse, because the standard momentum factor gave up so much ground in the last momentum crash of 2008–2009, it remains underwater in the United States, not only compared to its 2007 peak, but even relative to its 1999 performance peak. This means 18 years with no alpha, before subtracting trading costs and fees! To be sure, most advocates of momentum investing will disavow the standard model, and will claim they use proprietary momentum strategies with better simulated, and perhaps better live, performance. A handful (especially in the hedge fund community) may be able to point to respectable fund performance, net of trading costs and fees. But a careful review of the competitive landscape reveals that most claims of the merits of momentum investing are not supported by data, particularly not live mutual fund results, net of trading costs and fees. This is the fourth and final article in the Alice in Factorland series. 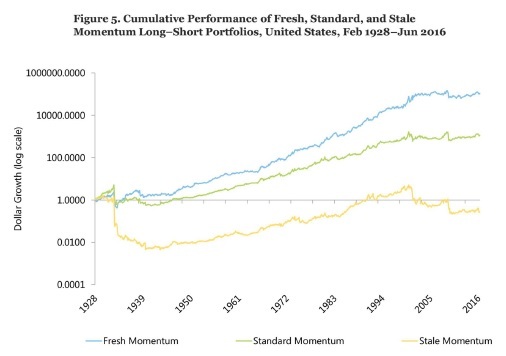 "One weakness of standard momentum strategies is that they do not distinguish between stocks as to whether they are early or late in their momentum cycles. We call the first group fresh momentum and the latter stale momentum. Stale momentum stocks are typically very expensive on the long side, and very cheap on the short side, with little likelihood of follow-through. Fresh momentum fares much better than stale momentum, especially since standard momentum went off the rails at the start of the current century. Investors will be better off if their strategies avoid stocks with stale momentum and instead rely more heavily on stocks with fresh momentum. If we’re going to incur trading costs to initiate momentum trades, we should perhaps concentrate those trades in the fresh momentum segment of the portfolio. Another weakness of most momentum strategies is high turnover and high trading costs. Momentum funds use momentum to initiate momentum trades. Why don’t we turn this logic on its head? Why not use momentum to block (or at least condition) trades for other strategies, such as value, quality, low volatility, Fundamental Index, and so forth? Using momentum to block trades should improve performance on two levels. First, our strategy will be trading less, not more; after all, we incur no trading costs when we are deferring a trade. Second, the momentum effect — without trading costs — is one of the most robust in the literature, notwithstanding recent disappointments. If momentum — especially fresh momentum — improves the timing of our trades, we extract momentum alpha while reducing our trading costs, giving us the best of both worlds. Momentum — at least as defined by the standard momentum factor — clearly does more harm than good on live assets in the mutual fund arena. It need not. It clearly needs saving. With a few simple steps, we think it can be saved, though not necessarily on a vast asset base." There is a large literature that reports time-specific anomalies in equity markets such as the Monday effect, the January effect and the Halloween effect. This study is the first to report intra-day time-of-day, day-of-week, and month-of-year effects for Bitcoin returns and trading volume. Using more than 15 million price and trading volume observations from seven global Bitcoin exchanges reveal time-varying effects but no consistent or persistent patterns across the sample period. The results suggest that Bitcoin markets are efficient. "The aim of this paper is to analyze market efficiency by testing for time-dependent anomalies in returns and trading volume. For example, do Bitcoin investors trade differently when major stock exchanges are open compared to when they are closed? Do they trade less on weekends and during the Northern hemisphere summer months (i.e., June - August)? To answer these types of questions, we analyze time-of-the-day (ToD), day-of-the-week (DoW) and month-of-the-year (MoY) patterns in Bitcoin returns and trading volume. Given the conflict between efficient pricing and the seemingly irrational demand for Bitcoin, we look for any consistent patterns in returns that would contradict the efficient market hypothesis. Since Bitcoin is a relatively new and unregulated asset, it is possible that the market has been dominated by retail investors. This suggests that we can expect to find inefficiencies and return anomalies in Bitcoin pricing. The fact that Bitcoin is continuously and globally traded makes an analysis of time-of-day, day-of-week, and month-of-year effects particularly interesting to study. Moreover, since Bitcoin is traded in different currencies and in different geographic locations, the market provides an additional layer of complexity similar to foreign exchange and commodities. Our analysis of time-of-day, day-of-week and month-of-year patterns shows evidence of time-specific anomalies such as a lower weekend volume effect and a higher Monday return effect which are more consistent with currency markets. We find increased trading activity on Bitcoin exchanges at times when U.S stock exchanges are open and lower trading activity between midnight and the early morning on most exchanges. Bitcoin exchanges denominated in USD display stronger patterns compared to exchanges denominated in Japanese yen and Chinese yuan. We use heatmaps to illustrate patterns in returns and trading volume both across time and across exchanges. The results support the view that Bitcoin markets are weak-form efficient because we do not see any consistent price pattern that could be exploited based on historical information. We also use statistical tests to check the robustness of the heatmap analysis and to determine the statistical significance of the effects."